At the bottom of the page! The demand for electricity in India is higher than the steadily available energy. In some areas, there is no electricity available at all. The deficit is being met by stimulating the development of renewable energy technologies (RETS). Wind energy – with a share of 70% of the total supply of RETS energy – has emerged as the winner within the program within recent years. Currently, an estimated 28,000 jobs have been created in the wind energy sector and this will grow to 84,000 by 2020 and 113,000 by 2030. 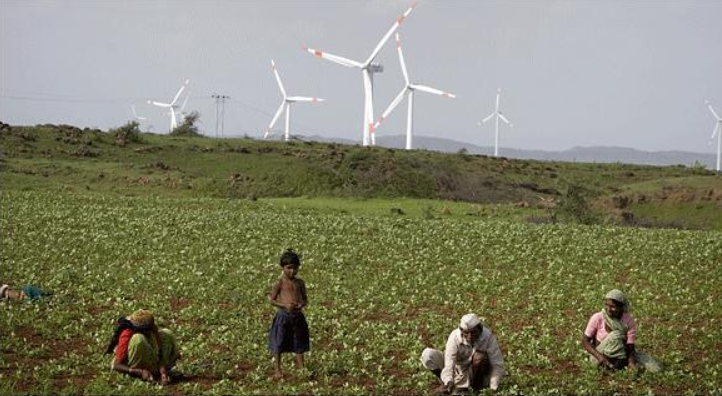 Thanks to our mix of wind energy projects in India, in regions such as Karnataka and Gujarat, local families, often in remote areas, are able to use a stable supply of clean energy. The low energy use by households in India means that a relatively high number of households can use the clean energy. The company that produces the wind energy informs the public about the effects and advantages of this green energy and energy efficient behaviour. They also contribute to ‘community care’ by establishing schools and setting up health facilities. The location of these wind farms is carefully chosen in areas with a high/average wind speed. The most modern wind turbine technologies are used to guarantee the highest efficiency and that as much energy as possible is generated. The infrastructure around the wind farms has been significantly improved. The combination of access to clean energy and good infrastructure creates new opportunities for the expansion of economic activities in the region. Do you have questions or would you like more information? Contact us at + 31 (0)30 232 61 75 or by e-mail at info@greenseat.com. Book a GreenSeat – you make it happen!